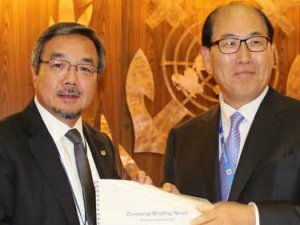 In a symbolic act of transition and succession, IMO Secretary-General Koji Sekimizu handed over a comprehensive briefing paper on IMO’s recent achievements and ongoing objectives to Kitack Lim on Thursday. The IMO Assembly has unanimously endorsed the appointment of Kitack Lim (Republic of Korea) as the Secretary-General of the International Maritime Organization (IMO), with effect from 1 January 2016, for an initial term of four years. Lim was president of Busan Port Authority until end July 2015. He served as the Republic of Korea’s Deputy Permanent Representative to IMO from 2006 to 2009 and was Chairman of the Sub-Committee on Flag State Implementation from 2002 to 2004. Addressing the Assembly, Lim pledged his commitment to undertake his duties with devotion and prudence throughout his tenure. “IMO currently faces an array of challenges and issues such as implementation of Member State Audit Scheme, emissions from ships, application of Goal Based Standards, increasing traffic in polar waters, introduction of e-Navigation, the Ballast Water Management Convention, counter-piracy activities, cyber security and safety standards for passenger ships and fishing vessels, etc. “However, with the collective wisdom and insight of all Member States and stakeholders, I am confident that we can withstand the storm and resolve such difficult issues. I hope we can come together as one to pave a new future for IMO, based on the noble efforts and achievements to date,” Lim said. The IMO Council, which is made up of 40 Member States, elected Lim as Secretary-General in June, subject to the approval of the Assembly, which is currently meeting. Lim was born in Masan, Gyeongsangnam-do, one of the major port cities in the Republic of Korea. He majored in nautical science at the Korea Maritime and Ocean University (KMOU), Busan, graduating in 1977. He worked on ships as a Korean naval officer and for Sanko Shipping Co. He joined the Korea Maritime and Port Administration in 1985, while continuing with further studies at the Graduate School of Administration, Yonsei University, obtaining a Master’s Degree in 1990. He then studied maritime administration with a major in navigation at the World Maritime University (WMU), graduating with a master’s degree. From 1995 he attended a doctoral program for international law at KMOU, completing course work in 1998. Lim began attending IMO meetings as part of the Republic of Korea’s delegation in 1986, actively participating in maritime safety and environmental protection issues. From 1992, he engaged in activities to promote maritime safety through effective implementation of IMO conventions in his country and other IMO Member States in the Asian region. He was elected Chairman of the Tokyo Memorandum on Port State Control in 2004. In 2006, Lim was appointed as Maritime Attaché, minister-counsellor at the Embassy of the Republic of Korea in London and led all IMO work for the Republic of Korea, serving as Deputy Permanent Representative to IMO up to August 2009. Lim was then appointed as Director General for Maritime Safety Policy Bureau at the Headquarters of the Ministry of Land, Transport and Maritime Affairs (MLTM). He led the delegation of the Republic of Korea to the IMO Assembly in 2009. In March 2011, Lim was appointed Commissioner of the Korean Maritime Safety Tribunal (KMST). In July 2012, he assumed the position of President of Busan Port Authority.